The last time we checked in on the mega success of Michelle Obama’s Becoming, it had topped Fifty Shades of Grey for popularity on Amazon. Now her publisher says the book has sold almost 10 million copies. That’s a lot of books. 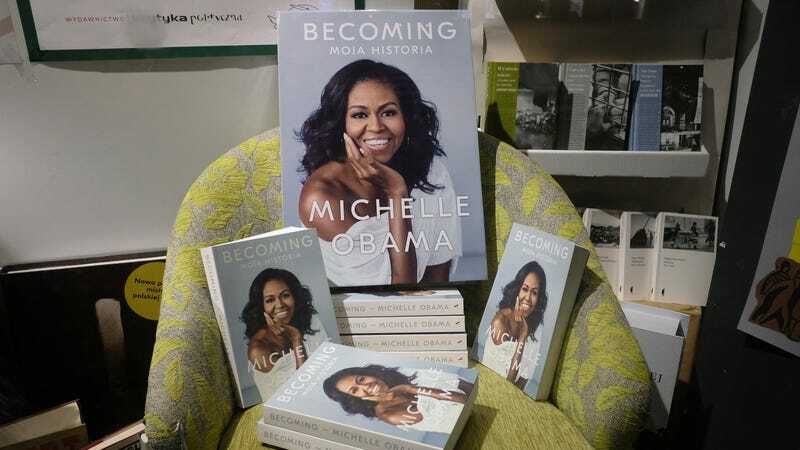 Michelle Obama’s memoir “Becoming” has sold nearly 10 million copies globally since its release in November, publisher Penguin Random House said Tuesday, adding that the former first lady’s tome could set a sales record in its genre. It’s tough to confirm whether this is the biggest memoir OF ALL TIME because of the patchwork nature of tracking book sales—it’s hard to measure across global markets, for instance, and Becoming has been translated into almost two dozen languages so far—but it’s safe to say that the book has been very, very, very successful. This is also just the first of two memoirs from the Obamas; Penguin Random House bought the rights to both in a package deal for, reportedly, an absolutely vertiginous $60 million. So are they actually going to break even? “Michelle Obama’s [book] is not only a literary success but a financial success for everybody involved, despite the high advance,” said Rabe. And they haven’t even published Barack’s book yet!